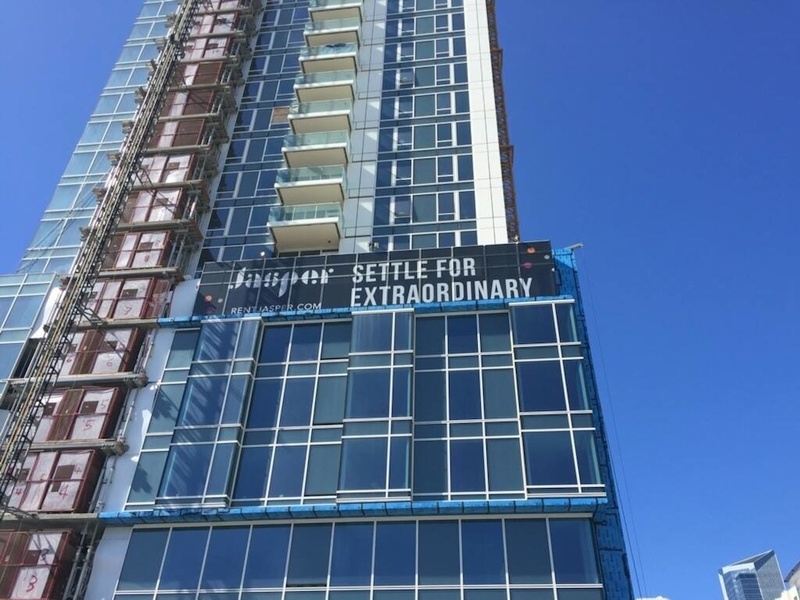 Signage is up at new Rincon Hill rental Jasper, which begins leasing in Spring 2015. A teaser site opened last month for the 45 Lansing Street building, which will rise approximately 400 feet when completed. Designed by HKS, the 39-story, 320-unit building by Miami-based developer Crescent Heights will come with a 265-car parking garage. The concrete tower with a glass curtain wall is seeking LEED Silver Certification. The project has been in the works since 2006, when Turnberry Associates paid $30 million for the site between First and Essex streets, according to the San Francisco Building & Construction Trades Council. After the financial crisis of 2008, Turnberry sold the property to Crescent Heights for $13 million in 2010. The next year, the San Francisco Planning Commission voted to approve the development, originally slated as condos, and to ramp up the number of units from 227 to 320, SocketSite reported. Construction commenced in 2013. Amenities will include a gym, pool, sauna, theater and valet parking. Completion is anticipated for the fourth quarter of 2015.